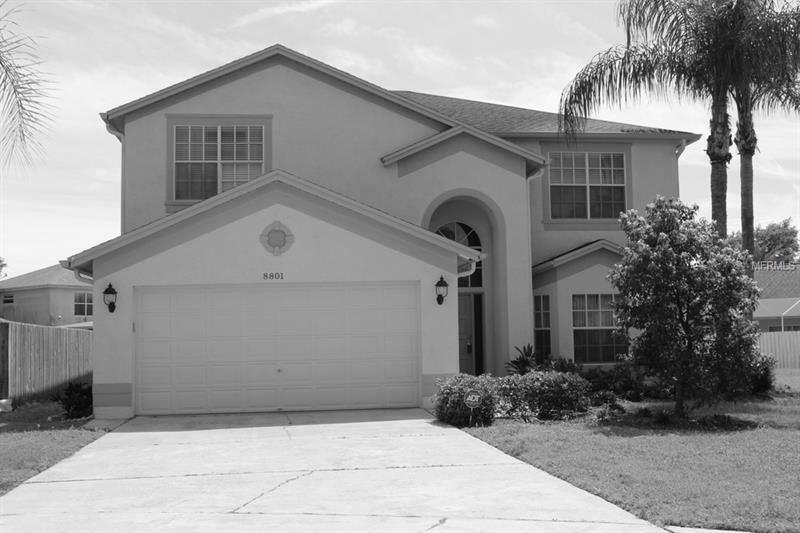 BEAUTIFUL 5 Bedrm 2.5 Bath Almost 3000sq ft greets you by a 2 story foyer. Perfect home for growing families/anyone looking for plenty of space. Located in a Cul-De-Sac (no thru traffic) Quiet street w/ friendly neighbors that look out for each other. The neighbors have been here for 15+ years. Formal dining room & living room w/ bay window. REAL Hardwood Floors. Stainless steel appliances solid surface re-glazed counter-tops desk nook in kitchen eat in kitchen opens up to the family room. Downstairs 1 full bedrm & 1/2 bath. Curved Staircase with Wood topped stairs leads into LARGE bedrooms possible double master suite. Owners en-suite has french doors leading to private balcony overlooking your HUGE +Â¼ acre yard. Features: double sinks & vanity walk in shower separate garden tub linen closet WC & 2 supersized walk in closets. Inside laundry room to garage w/ side access door. You'll LOVE the spacious screened lanai w/ double pocket sliders overlooking backyard fenced almost entirely by your neighbors. GREAT Schools Alonso w/ Robinson being home of the IB program. This home is minutes from Upper Tampa Bay Trail YMCA airport restaurants close to beaches & EVERYTHING Tampa Bay Has to offer! Countryway features a nice Golf Course with 18 holes just $12-$29 pro shop restaurant lounge walking trails fishing ponds and benches fully fenced Doggie park basketball courts volleyball lots of picnic tables baseball diamond fields for play Very low annual HOA fees and NO CDD fees here!